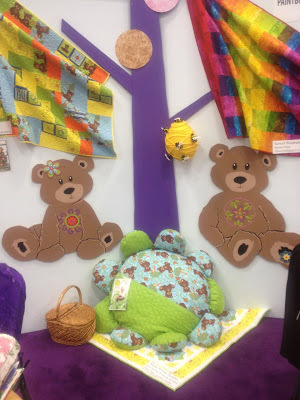 Designing the booth for Quilt Market is one of the really fun parts of the job. 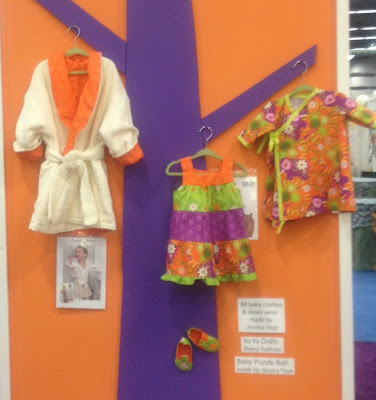 Last week, we offered a sneak peek at one of our new fabric lines debuting at Market, Mystic Forest, and some of the decorations for the booth that it inspired. Today, we'll give you the whole booth tour. 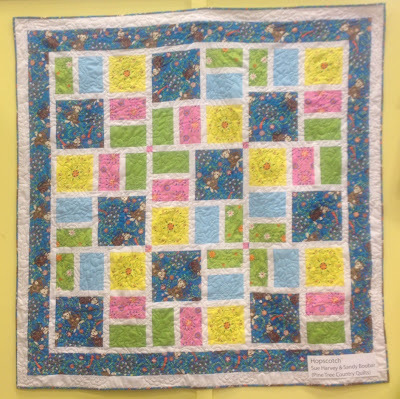 As well as some fun quilts and projects featuring Marblehead Global Brights and Pleasing Pastels. Now on to your tour! 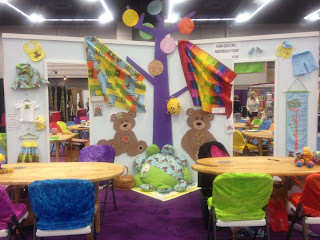 The front of the booth, with a cool purple tree growing circular Marblehead "leaves," and plenty of projects made from the bear colorway of Mystic Forest. 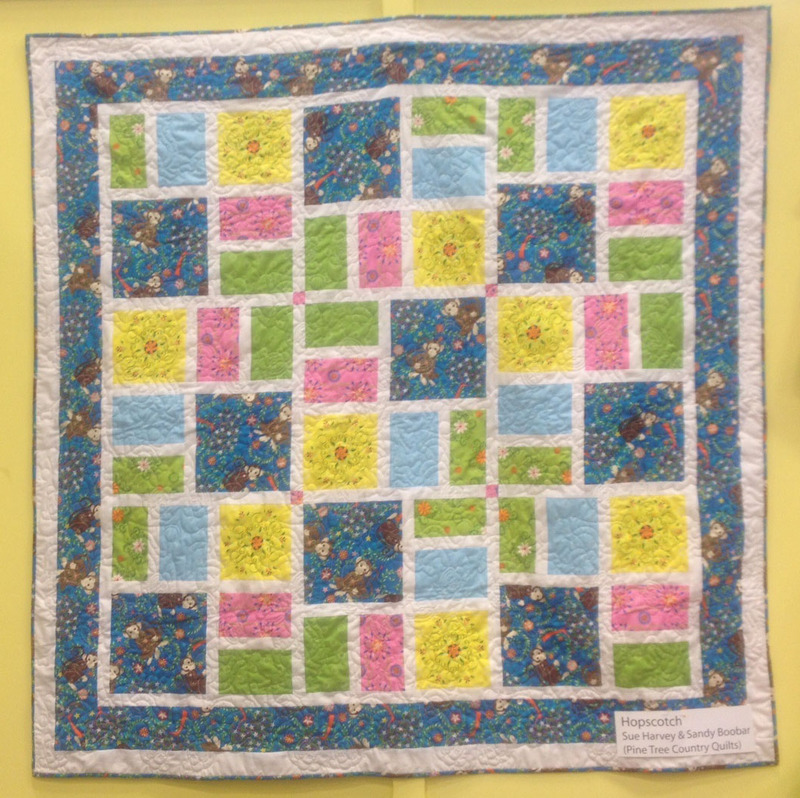 Do you recognize Jessica Toye's Sunset Boulevard Marblehead quilt hanging from a branch? A closer look--check out that beehive! 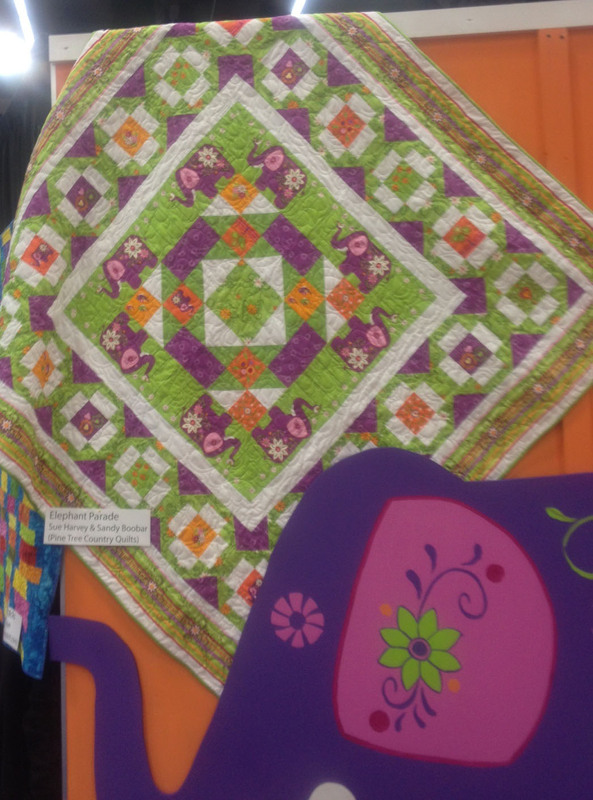 We love the huge flower floor pillow too. 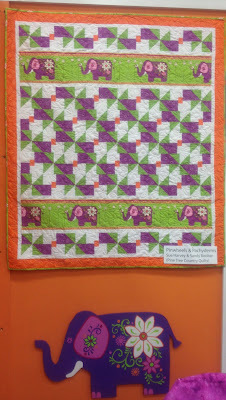 "Pinwheels and Pachyderms" designed by Sue Harvey and Sandy Boobar of Pine Tree Country Quilts, accompanied by a coordinated painted elephant. Don't you love how these fabrics look in children's clothes and accessories? 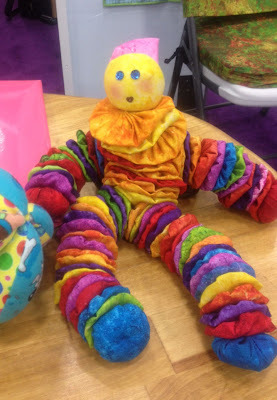 Did you have (or make) a yo-yo clown when you were a child? 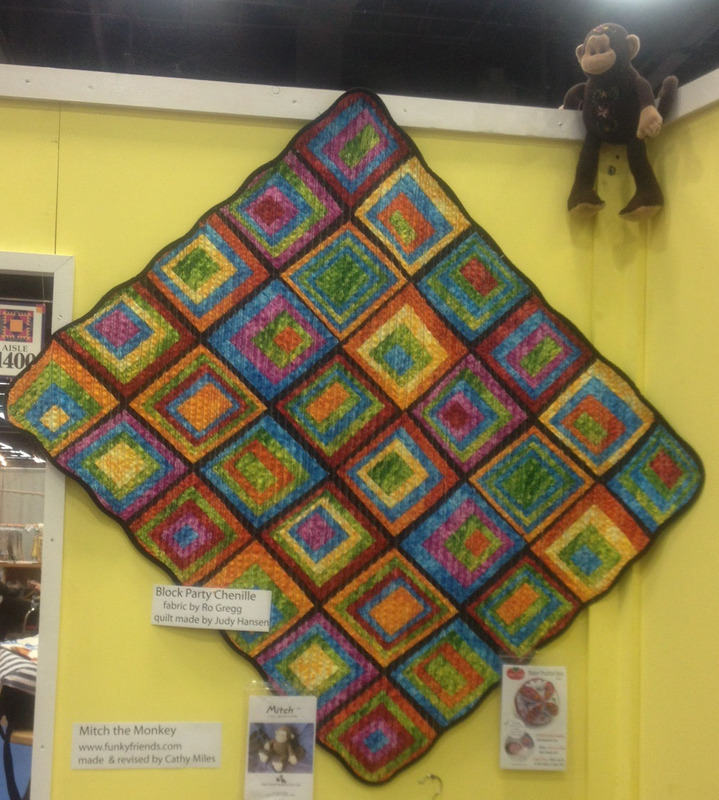 We had a few Marblehead Global Brights yo-yo figures in the booth. And there's our booth! Please leave a comment if you have a question about any of the patterns you see in these photos. You'll definitely be seeing some of them again, and we'll let you know where and when! 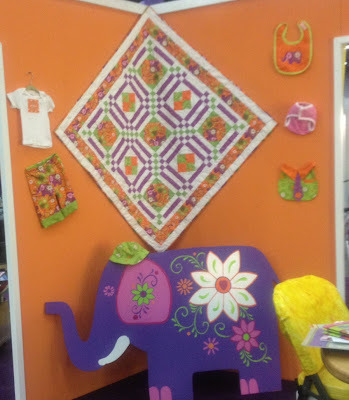 The booth looks fabulous and the elephants are super cute!! Oh! I love the elephants! When is this fabric going to be available? 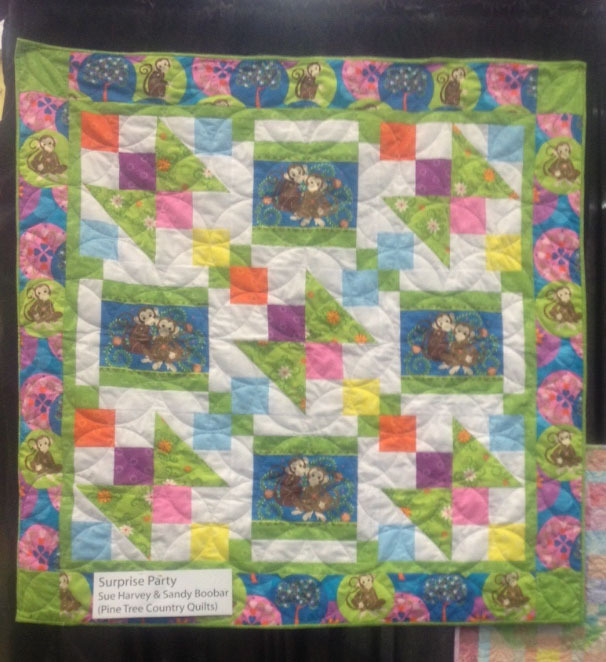 and the patterns for the 2 quilts? Glad you like them! The fabric will be available shortly! 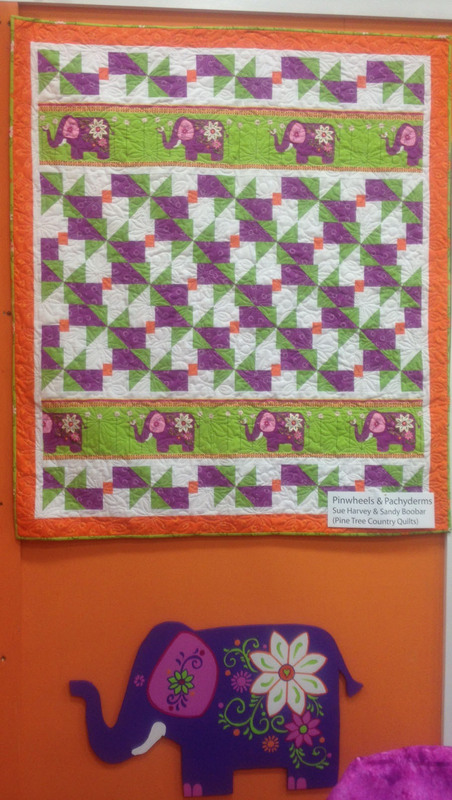 We'll post more info on the quilt patterns when we get it.